I am emotional about the old year ending. 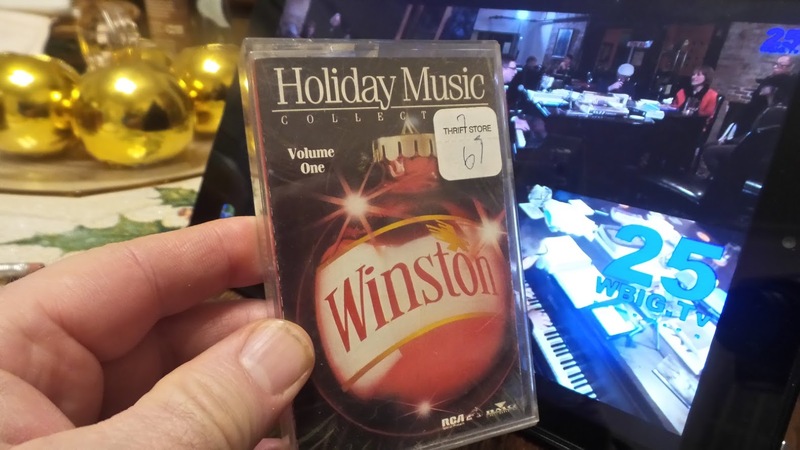 I know, this year I went caroling a couple of weeks ago, and it is a wonderful memory, bursting into bars with my friends singing "Fast away the old year passes, hail the new, ye lads and lasses!" and happily accepting free drinks. But still. This was just one crazy magical year. Bad things happened and good things happened but at the end I feel I landed on my feet. And what more can you ask for? I am having a wonderful time drawing and painting and I feel very blessed. My head is clearing after decades of round-the-clock, 24/7 busyness and I feel I should be able to get a certain music writing project wrapped up, not that anyone remembers that besides me but the point is, I do. This was the year Howard began his donut business and that has been fun. At St. Anthony's at Christmas we had the first Latin Midnight Mass that Buffalo has seen in many years. And I do not need to remind anyone that it was an epic year for thrift shopping. Just check out the picture at the top of the post. That was a score from just yesterday. Long story short, what I am getting at is, this was a tremendous year in many ways. And it is setting up to be so next year is even better. Still, you cling to what you know and I feel nostalgic that this year is ending. 2018 ... Sure there are always less-than-great things that happen in any year. People die. Things happen. But all in all, it was a very good year. I drew this horse and rider and it looks great! But do not get all excited. I drew it because I am working my way through the book "Drawing on the Right Side of the Brain." It is an upside-down drawing! 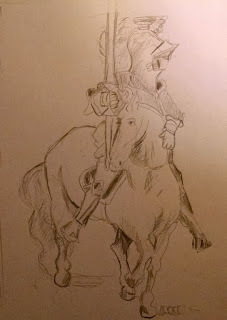 The horse and the knight were originally drawn by some medieval German artist and you turn it upside down and copy it. Suddenly I can draw a horse! I had heard of this book from a long time ago but I never read it. Recently I inherited a copy because my sister's father-in-law is downsizing and my brother-in-law was nice enough to pass on to me many of his father's art books. I thought: There is a reason I have this book. I am supposed to look into it. Because I do want to polish my skills and this book seems like a neat way to do it. It is fascinating what the book has in it about the right side and left side of your brain. You are reading it thinking: So that is what is going on in there! I am not sure I need all the exercises but I do them anyway. I realize that the left side of my brain does tend to dominate and say, "You don't need this stuff." And it cannot hurt, you know? But I already do already have some of the thinking the author talks about. She said that when you were doing an upside-down drawing, you would start losing track of time, and also that it might seem you were putting together a puzzle. Just last week that was how I had described it to Howard, what it is like to do a drawing. I said, "It is like putting together a puzzle." And he asks me how long certain drawings take and I cannot tell him. I honestly do not know. Well, something similar happens when you are writing, too. I think you lose yourself in something and the time just goes. If I know so much why ain't I rich? I had a roommate who used to ask me that. Well, I am on my way. 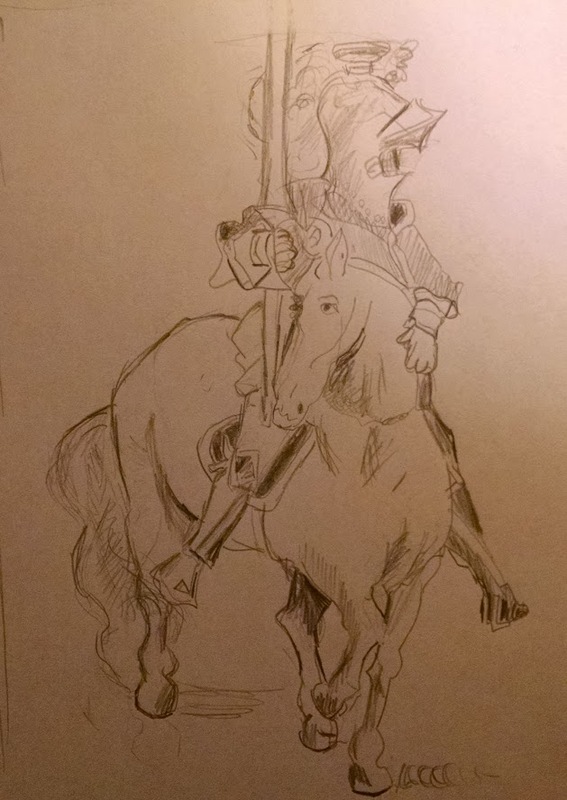 I have drawn the upside-down German horse and rider! 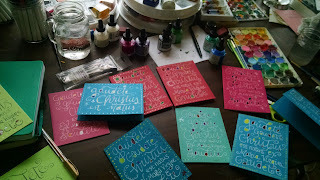 On the Fifth Day of Christmas I found myself making Christmas cards. I know, I am jumping the gun just a little. In the traditional Catholic crowd I run with, it is not only acceptable, but it is encouraged, to wait until after Dec. 25 to send your cards. 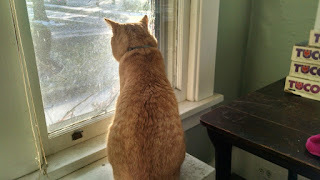 It is especially desirable to wait a little later because Christmastide extends till Candlemas, Feb. 2. And after that you will find all of us at the gym doing overtime. That is because of the Tom & Jerrys which are another story for another day. I could not believe how I took to these Christmas cards once I had found my groove. I love working with letters. I just love it. 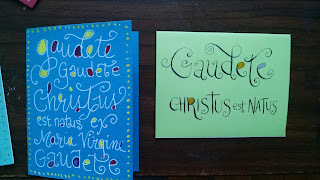 For one card I wrote with a wide-nib dip pen and white ink. It was kind of chalky but when it was dry I drew in the letters. I striped one stroke and I added dots to another one... Too much fun, is all I can say. For a while I was writing on the cards with a white gel pen: "Gaudete, gaudete, Christus est natus, ex Maria Virgine, gaudete." It was a mouthful but it filled the card and I had a lot of fun with it. I filled letters in with my Dr. Ph. Martin's ink that I splurged for a while ago at Michael's. If not now, when? 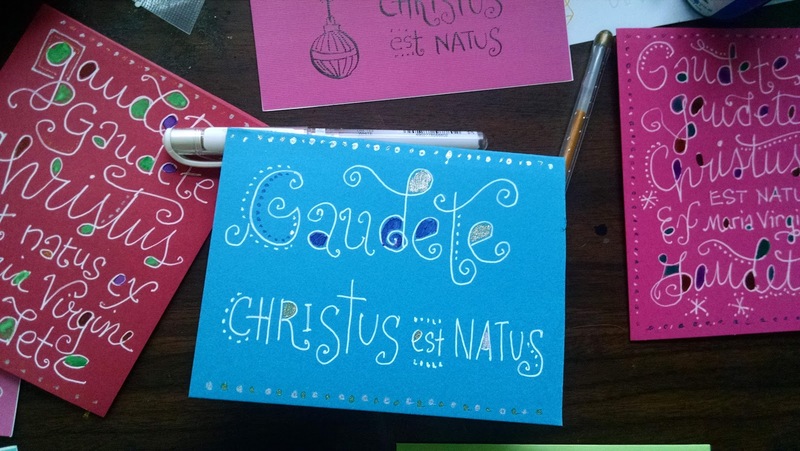 Then I decided to cut the words back and I did, "Gaudete, Christus est natus." That green card below, by the way, it is not finished. I add a lot of gold and silver and stuff because I believe that belongs on Christmas cards in vast quantities. It goes like it goes as the David Shire song goes. I just hate to see the tradition of Christmas cards disappearing. I like traditional Christmas cards, too, as opposed to the ones with photos. I mean, the photo cards are better than nothing, but I like cards with artwork. Even a tacky Santa I will take, with rejoicing. I love the entire genre. And I am proud to be contributing to it! I even wrote on Facebook that if people sent me their addresses I would send me one. I got about a half dozen responses. See, that is how popular I am. I got to sketch outside today. That was exciting! It is not as if I never draw in the cold but when it is beastly cold you cannot. 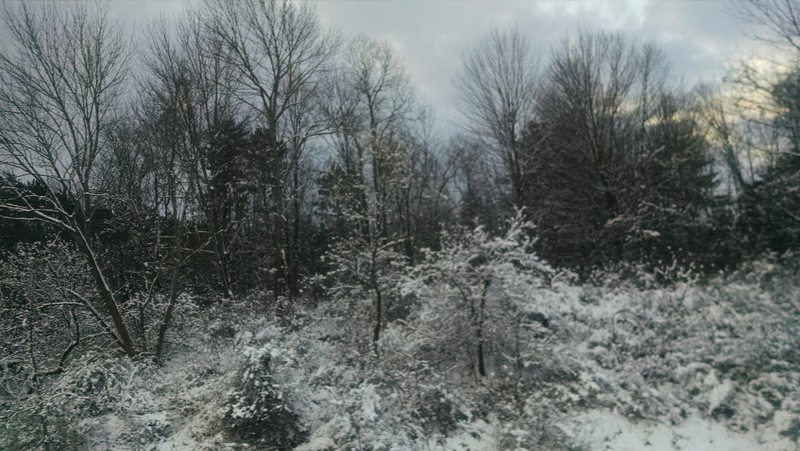 Today it was -- I want to say it was almost in the 50s, because you did not need gloves. 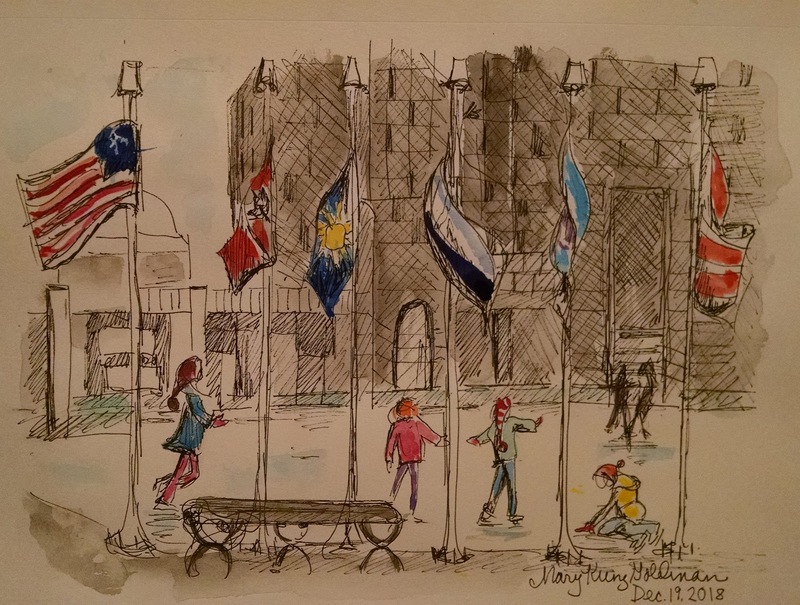 So I sat outside the, ahem, Buffalo and Erie County Public Library, and I drew the Brisbane Building. It felt like spring, even as it was getting dark. I always seem to be drawing when it is getting dark. Howard looked at it later and he liked how I drew the flag at half staff. He said it showed I was drawing it for real, as opposed to from a photograph -- just the way it was. He said, "The flag makes you feel a little uneasy." And I was thinking, I wonder if my picture of the Brisbane Building does make people feel uneasy? If it does, though, I do not think it is because of the flag. I think it was because I once worked there! I worked there when I was with Citibank and that was one job that just ended up blowing up in my face. One of these days I will describe that but meanwhile, if the picture looks stressful that is why. I am glad it is now and not then. I am glad I am drawing the Brisbane Building, and not working there! 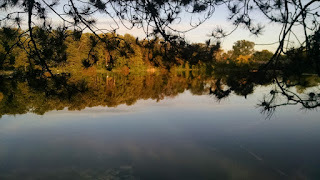 You know how Monet went back again and again to his lily ponds? And Georgia O'Keeffe returned to her New Mexico landscapes? I keep returning to this one Buffalo alley. 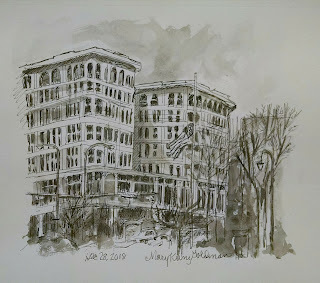 It is downtown and for some reason whenever I draw it, it is always getting dark. The other night there was smoke coming from a chimney and I sketched it and signed it with a flourish, as you can see up above. Your signature is the thing about art that is the most fun! See, this is something other artists will not tell you. This was the sketch before I put in the shadows. I kind of like it that way too! But I thought about what I loved about that alley and it was the smokiness of the scene. 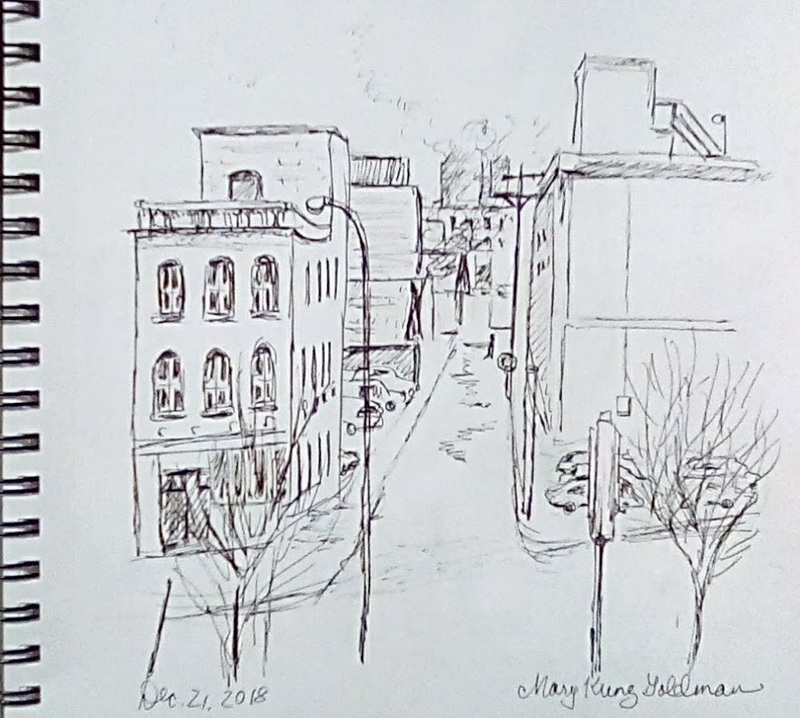 Earlier when I sketched this alley it was from a different angle. What I loved about it that time, looking at it from that slightly different direction, was the building in the middle, on that garage building, and the snow on the roof. That building is just so cool!! I want to go back and try it from that angle again. In the upper versions you can only see the edge of it. 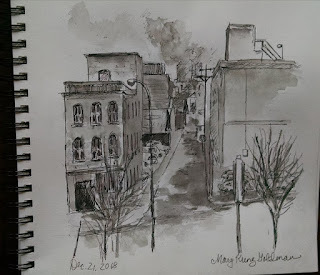 When darkness descended I drew the alley again. From this angle I had a good glimpse of the gas station sign in the foreground. I loved drawing that sign. In the top picture you just see the edge of it. And I did not even show you the mistakes! 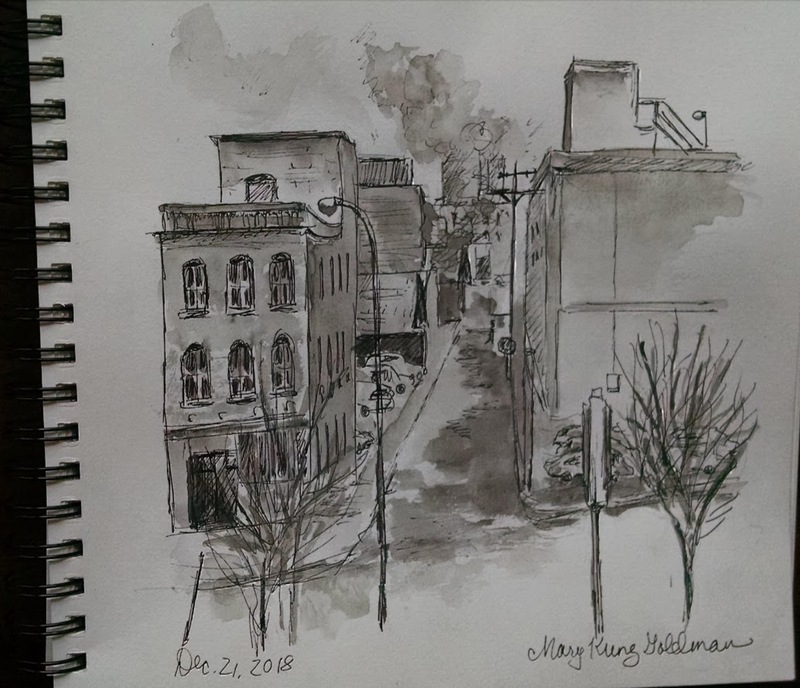 I love drawing that alley, is all I can say. 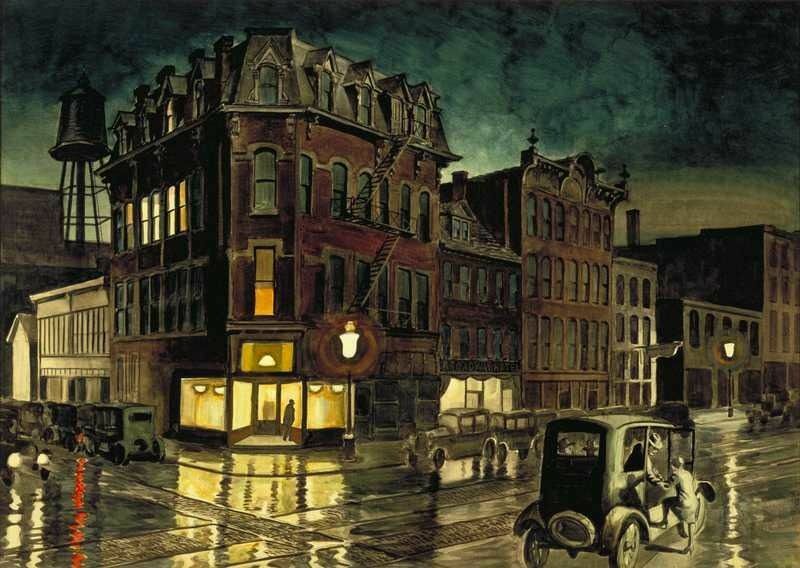 By the way right to the left of the alley -- it would be off the paper -- is the famous "Rainy Night" corner building that Charles Burchfield painted so magnificently in 1930. Here is Burchfield's famous painting. He returned to that building several times. I just read that and I loved it because it made me think of me and the alley. I started reading up on Burchfield recently because some people who saw my drawings said my style reminded them of his. Which, could you please tell me that again? Anyway. That is the greatest compliment ever, and I am not going to say I deserve it. But I am enjoying learning about Burchfield because I am seeing that many of the things that appealed to him are the same things that appeal to me. And I think we share some of the same ways of thinking and looking at things. This is cool: If you look at Burchfield's corner house, the house that stars in his picture, and count over three houses to the right, according to my calculations that is the building that stars in my alley picture. The two buildings in the middle are gone now, replaced by a pawnshop and I forget what else, probably a parking lot. 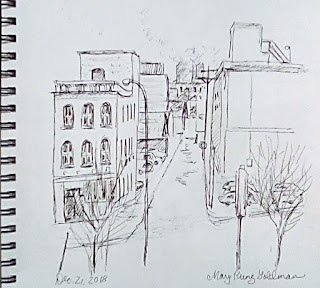 But that building on the right, the little one with the four rows of windows -- that has to be the building on the left in my sketch. 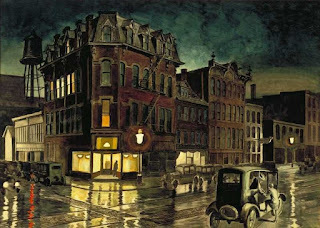 And sure enough, in the Burchfield painting, to the right of that building, you can see my alley. I wonder if Burchfield ever painted it? If he never got around to it, that's too bad. But he can rest easy. 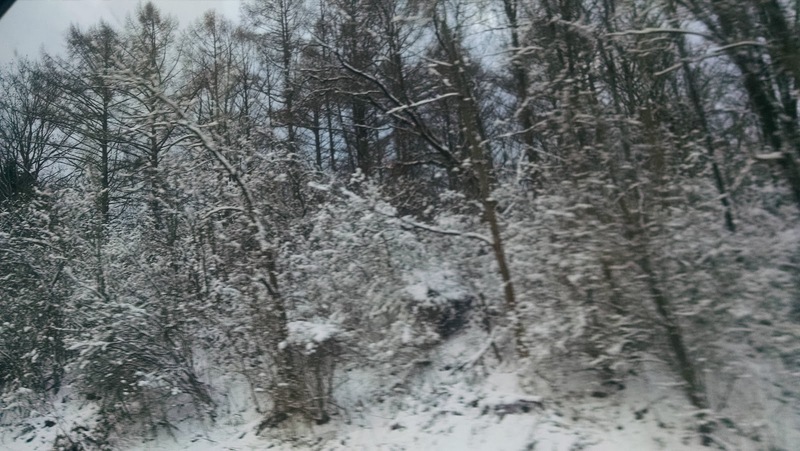 That picture looks wild but it is just something I snapped out the window on our way to see my sister Katie last night for Christmas dinner. They live in East Aurora, aka the Snow Belt. 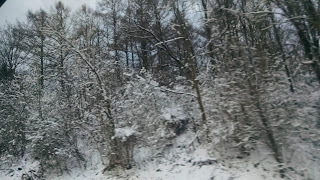 They got snow. We did not. It was exotic to me and so I took another picture. At my sister's house disaster hit. I could not stop eating! I started with split pea soup my brother George brought in a Crock Pot. He set the Crock Pot down on the floor near the Christmas tree and you had to go help yourself there. Then we sat down at table and the food just kept arriving! My sister's husband, David, is a hunter, and there was venison. Venison like fine steak, pink in the middle and sliced really thin and enjoyed, at least in my case, with horseradish. There were mushrooms that David foraged. And Katie made some kind of dish involving what I believed to be roasted pears and onions -- delicious. A platter of turkey showed up. And David is also a fisherman and served the most delicious steelhead trout. Howard thought the trout was the most delicious thing there and that was saying a mouthful. Speaking of mouthfuls we also had a huge bowl of mashed potatoes, yummy with the mushrooms. A beautiful big salad with pomegranate and blackberry vinaigrette. I cannot remember what else. The thing is, dishes just kept showing up, one after another. After dessert, which I will not even get into, I was so stuffed I could not move! I asked my sister if I could help wash the dishes just because I wanted to get on my feet and move. She said no and then brought some cranberry liqueur a friend had made. And we had that. There was also a great Crock Pot full of Celestial Seasonings Bengal Spice, our favorite. That was the only thing I consumed that had no calories. As Neil Young sang, ohhhh, the damage done! Today all I wanted to do was be on my feet. So it being Boxing Day I boxed up tons of things I did not like any more and that were getting under foot and I took them to Amvets. I managed to get out of Amvets without buying anything to take home to replace the stuff I had delivered, which is what I usually do. I parked way across the parking lot so I would have a hike. Later I thought: Uh, Mary, you could just go to the gym, you know? It is the Second Day of Christmas. 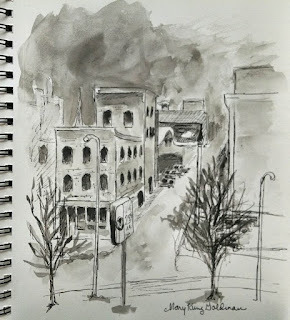 Today my friend Meghan and I went downtown to sketch and wound up bombing around. Which I loved. When was the last time I bombed around? I could not even remember. 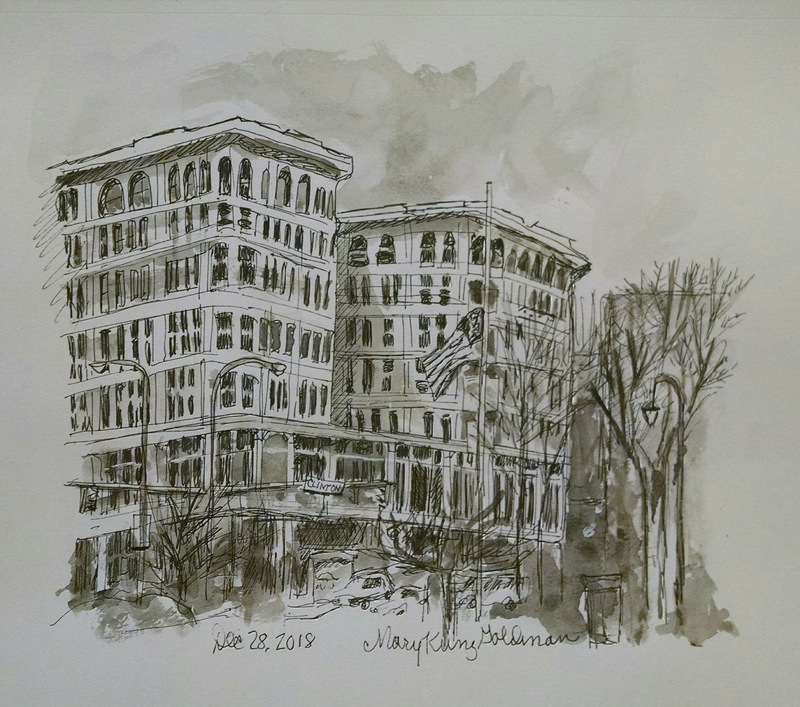 We went to Fountain Plaza and sketched the skaters. That is my masterful rendition up above! It was something different for me and I had a lot of fun with it. Then we turned around and sketched the old Buffalo Savings Bank across the street. And after that we went wandering down Main Street and there was a hot dog man and so we ate hot dogs. Then we found ourselves in Roosevelt Plaza and we drew the Hiker. That is a statue put up to commemorate the veterans of the Spanish-American War. Here is what I loved. The whole time we were sketching, nobody stopped and wanted to see our work. However, everyone looked at us and then they looked up at the Hiker. I loved that people were looking at the statue. I loved that they noticed it. Normally people walk by statues and never notice them. After that Meghan was a little cold so we stopped in a hip coffee shop but it was small and crowded so we went to the Lafayette Hotel and got coffee at the Public. We got our coffee to go and, coffee in hand, aimlessly wandered the hotel, all three floors, admiring how beautiful it was. Then at long last we emerged and meandered down to the Electric Tower. We wondered if we could go in and sure enough, we could. There is a pretty coffee shop in there so next time we get coffee that will be where we go. To our delight the corridors of the Electric Tower were lined with historic photos of the place. We learned what it used to do, which was sell electric appliances, lamps and refrigerators and such. We must have pored over those pictures for an hour, discussing the eras they portrayed, and what our lives would have been like had we lived then, and whether or not we would have been able to do our hair like the women in the pictures, and how people used to dress, and which buildings were there then that are not there now, and why was it necessary to take them down. 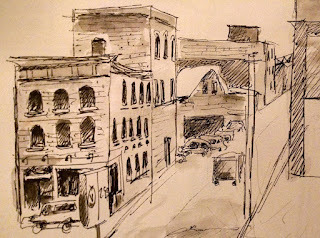 After the skaters and the Buffalo Savings Bank and the Hiker we never did end up doing another drawing. However I did feel we accomplished something. Later I realized I had not taken a single picture. I had snapped nothing with my camera! I had only what was in my sketchbook. And that preserved the day, you know? 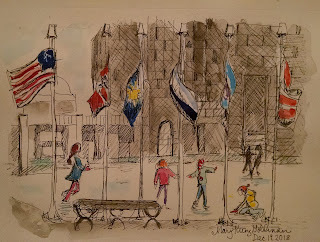 Looking at my sketch of the skaters I remember it all, how the flags were flying in the wind, how one skater fell on her bottom, what the day was like. Leonard Pennario told me that he never took pictures, that what he had in his head was better. With me it is what is in the sketchbook. 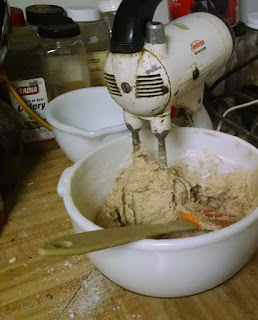 Piously, this year I was trying to stay away from Christmas baking. Aside from church coffee hour, I mean. I can bring things to church coffee hour and not eat them myself. OK, not eat so much of them myself. My niece and nephew came over yesterday to decorate my Christmas tree. Yes, it went up! I put it up on Sunday and we decorated it yesterday. And naturally we had to bake. Well, Barbara and I baked. Her little brother just wandered in now and then to lick the beaters. We did not mess around. We cut right to the good stuff and made fruitcake. It was called Applesauce Fruitcake and Alexa gave us the recipe. "Alexa," I said to my tablet, "find us a Martha Stewart fruitcake recipe." Because I made these wonderful fruitcakes once and I remember the recipes were hers. 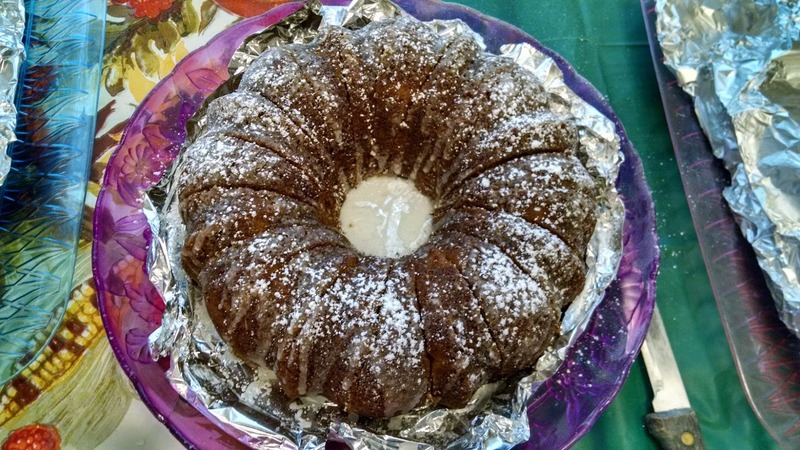 Alexa gave us this applesauce cake recipe and whether or not it was Martha Stewart it was great. Making it was a little problematic because the tablet kept blacking out on us whenever we got busy and neglected it. But a robot does not judge you. And so we could feel free to say again, every five minutes, "Alexa, find us a Martha Stewart fruitcake recipe." And this one would bounce back up. It was something like No. 20 on the list. The cake could not miss seeing that everything we put into it was great. Butter from Aldi, maraschino cherries from Price Rite, dates from I forget where, thick homemade and home-canned applesauce made from apples from that tree going begging in the Town of Tonawanda. It baked for about an hour and a half and then it was so good that I did not do as I had piously planned, and send my assistants home with it. When my brother was ready to leave with them, I grabbed half that cake to keep for myself! It was just so good!! It has chopped maraschino cherries and dates and walnuts. The World War II Sunbeam Mixmaster went the distance as you can see in the picture above. 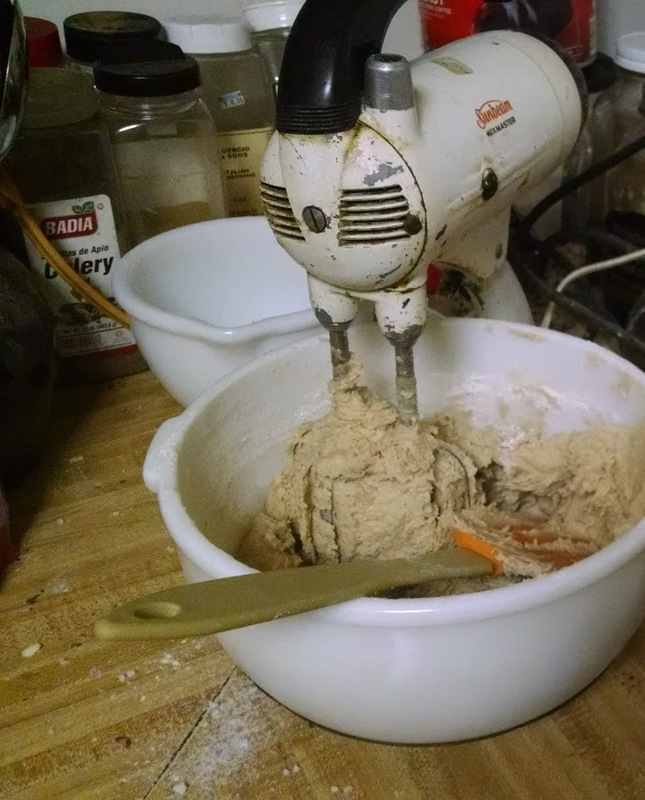 You know that mixer smell? It was in the air. I love that aroma and there is no describing it. The cake, too, has an intoxicating aroma. I felt like Eve giving the apple to Adam when I gave Howard a slice to eat. He loved it too! Help us stay away from this cake! A little while ago, just because I had dinner ready and Howard was not home yet, I sat down at the old Steinway and played Beethoven's "Appassionata." Well, I did not know it would go as well as it did. Aside from running through the first movement yesterday, I had not played it in yikes, 15 years. But it came back pretty easily, I have to say that. Something is almost funny in a way. I think I play better than I used to. Which does not make sense considering I have played hardly at all in 10 years or whatever. When I went to California to see Leonard Pennario I stopped playing. I do not know what it was. I think it was that I loved Pennario and when he died I just did not want to play, because what was I next to him? Maybe it was something like that, who knows. Who cares, at this point. The long and short of it is, I have been going back to it a little bit here and there, and oddly enough, I am a lot better. Every time I leave the piano for a few years and go back to it I am way better than I was. Another thing, it might be now that I have become a better listener. Part of that comes from listening to Leonard while I have been working on his biography. Part of it comes from working so long as The Buffalo News' classical music critic. I had to listen to a lot and listen carefully and with an open mind. Not to brag, but when it comes to music, I amaze myself with my capacity to listen. I got better at it over the years. I can sit through entire long, long concerts and never cough or move or fall asleep. I sit there motionless but wide awake, listening, listening, listening. So maybe that has made me a better pianist when I was not looking. Another thing, my teacher, Stephen Manes, he was great with me. Now and then through my life I have met people who, their teacher told them over and over how great they were, and they have these big egos as a result and it stunts them. Stephen never told me I was great. Heck, he never told me I was good. Instead he worked me hard. As I was reading through the Appassionata just now, there were signs of a struggle. Faint signs, in pencil, but eloquent all the same. Stephen always wrote freely in my scores, but his writing was always very faint and in pencil and I was finding it hard to read. It was a victory when, at one point, I made out "Rich tone." My writing was no picnic either. Mostly what I wrote was notes. The notes in the Appassionata get really high, way above the treble staff, and really low, below the bass staff. Now, as opposed to then, it occurs to me that Beethoven was pushing the envelope of what was the normal voicing of the piano. He had the hands very far apart, or else very close together high up or low down. Anyway, I would count up the lines and the spaces, and pencil in "E flat," or "C," or whatever. I seem to remember Stephen was kind of disgusted by that. And now I can kind of see why. Often these notes are part of arpeggios or something, and you can figure out what the notes are without counting up the lines of the staff or having to write them. Well, having said that, I have to say that my old notes did come in kind of handy. Anyway, the Appassionata. Because I can!! Play the piano daily and stay sane! My Christmas tree is not yet up. Yet I have a Christmas song on the brain. What song, you ask? The same song that is on everyone's brain. "Baby, It's Cold Outside." The more you hear that it's banned, the more you keep thinking about it! It kind of bugged me how people are suddenly condemning this song. My sister even told me last week she had always thought it was kind of creepy. All these years, she never told me she thought that song was creepy. You know what I think the problem is? People aren't taking the melody into account. It is this sweet and flirtatious tune. As I said to Howard the other day, if you are going to go down this road, ignore the music and ban things because words are offensive, there goes half of opera. Certainly you could kiss this duet goodbye. We did a little research into "Baby, It's Cold Outside," because it was on our minds. I did not know it was by Frank Loesser, who wrote the musical "Guys and Dolls." Don't say that too loudly. "Guys and Dolls" will be next on the chopping block, because of the demeaning term "dolls." I did not know it won the Academy Award. One more funny thing, if you look up the YouTube clip of the movie "Neptune's Daughter" which featured the song, first you see the guy trying to get the girl to stay, and then you see the girl trying to get the guy to stay. "Neptune's Daughter" must get its name because it starred Esther Williams, the famous synchronized swimmer. 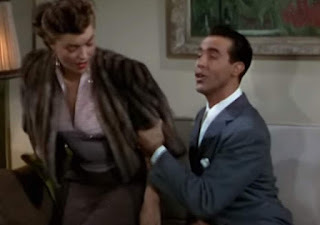 A romance featuring a synchronized swimmer and the song "Baby, It's Cold Outside" ...? I had not known any of this. Well, neither does anyone protesting the song. They're going to be protesting me soon, because now thanks to them I've got the song on my brain, and just like the gal in the picture up above, it's not going anywhere anytime soon. It's in, and it's got to come out. Almost all my photos fall into one of just several categories. 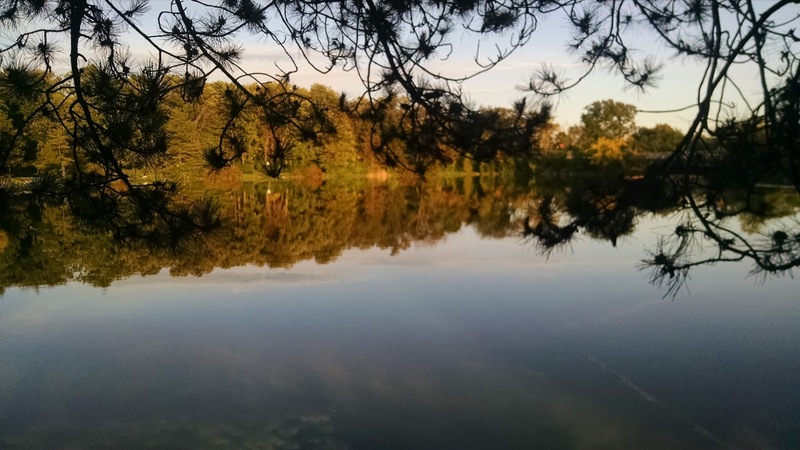 Views of Buffalo -- Delaware Park, downtown, and other locations. It is a funny thing now. Something strikes you as pretty or dramatic, and you have to snap a pic. Wow, how the months pass! That was not that long ago. The third category is things I am baking or have baked for church coffee hour. I did not realize I have taken so many hundreds of pictures of cakes and pastries and whatnot. You cannot have too many, that is for sure! With which, above is the Whiskey Squash Cake I made for today's gathering. My friend Joe at church is a master gardener and he grew these mega-squashes, five or six of which I inherited. I have a way of inheriting Joe's stuff. In that picture of Jeoffry up above, of Jeoffry looking out the window, those are Joe's TUCO puzzles. Well, they came from him. They are mine now. But back to the squash. They looked like Delicata Squash only much, much bigger. I could find no hint of how to cook them so I roasted one of them at 350 degrees while other things went in and out of the oven. It may have stayed in the oven a bit too long, however, not a bad thing. The squash's skin was so crisp and roasted that it just fell away. You know what I hate? The word doneness. So I will not use it here. I will just say that the squash was well done. And in the cake it married nicely with Early Times whiskey. Ha, ha! I always laugh thinking of that. My brother George and I were once on one of our road trips going God knows where, and we went through Kentucky, and we kept seeing that the official whiskey of the Kentucky Derby that year was Early Times. We would always laugh at the billboards because all we could think was Early Times meant that you drank it at 6 in the morning. Baking the whiskey into a cake lets you enjoy it politely at, well, early times. This cake was gone before I could taste it. I'll have to roast another mega-Delicata! And uncork, again, that bottle of Early Times.